Millermatic 252,Welds material from 22 gauge to 1/2 in. thick in a single pass. Highest output in its class. (NARRATOR)>> TODAY OUR BLAZER CHASSIS IS BACK FOR AXLES, EIGHT LUG CONVERSION, PERFORMANCE SHOCKS, AND AN EASY TO INSTALL FOUR INCH LIFT KIT. PLUS WE'LL SPILL THE BEANS ON OUR KFIVE POWER PLANT. THAT AND MORE TODAY ON TRUCK TECH. (JEREMY)>> HEY GUYS, WELCOME TO TRUCK TECH. 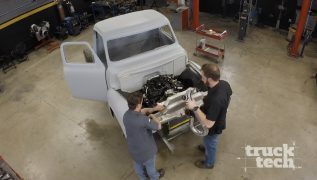 IF YOU LIKE FULL SIZE SQUARE BODY TRUCKS AS MUCH AS WE DO THEN YOU'LL ENJOY TODAY'S SHOW BECAUSE WE'RE DIVING INTO THIS FULL FRAME OFF RESTORATION ON OUR KFIVE BLAZER. (LT)>> WE'RE ACTUALLY MAKING REALLY GOOD PROGRESS. WE HAVE OURSELVES A NEW DONOR REAR AXLE, THE FRAME IS LOOKING GOOD WEARING A FRESH COAT OF BLACK, WE HAVE A SUSPENSION SETUP THAT JUST ARRIVED, AND A LITTLE BIT LATER WE'RE GONNA SHOW YOU WHAT WE HAVE IN MIND FOR THE POWER PLANT. 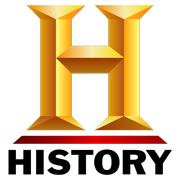 (JEREMY)>> AND WITH THIS MILESTONE COMPLETE WE'RE MAKING GOOD PROGRESS ON ALL OF OUR PROJECTS THIS YEAR. SO FAR WE PUT TOGETHER PROJECT WORKAHAULER, OUR F-150 LUXURY PICK UP WITH FOUR INCHES OF LIFT AND 35 INCH TIRES. (LT)>> "IDENTITY CRISIS", OUR RETRO THEMED '67 EL CAMINO GIVEAWAY FEATURING A 550 HORSE LS UNDER THE HOOD AND '70'S THEMED GRAPHICS. 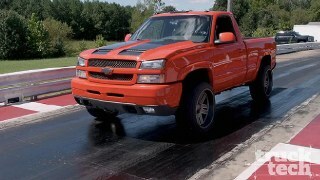 "SUPERMAX" IS OUR BRIGHT ORANGE DIESEL SPORT TRUCK POWERED BY AN LBSEVEN. 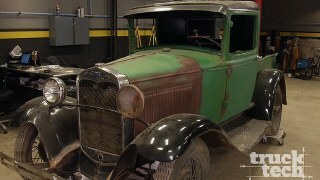 (JEREMY)>> AND MOST RECENTLY OUR 1930 MODELA, THAT WILL BE TRANSFORMED INTO A '50'S STYLE STREET ROD WE'RE GONNA CHOP, CHANNEL, AND THROW IT TO THE GROUND, AND THAT BRINGS US TO OUR "KLASSY KFIVE". $7,500 BUCKS GOT US THIS '89 FULL SIZE THAT WE IMMEDIATELY TOOK TO THE TRAIL. (LT)>> AFTER THE FIRST OBSTACLE IT WAS EASY TO SEE WHY THESE TRUCKS ARE SO POPULAR WITH THE OFF ROAD COMMUNITY, AND WHY THEY STILL HOLD THEIR VALUE TODAY. SHORT WHEEL BASE, BIG BODY. THESE TRUCKS ARE JUST PLAIN COOL. 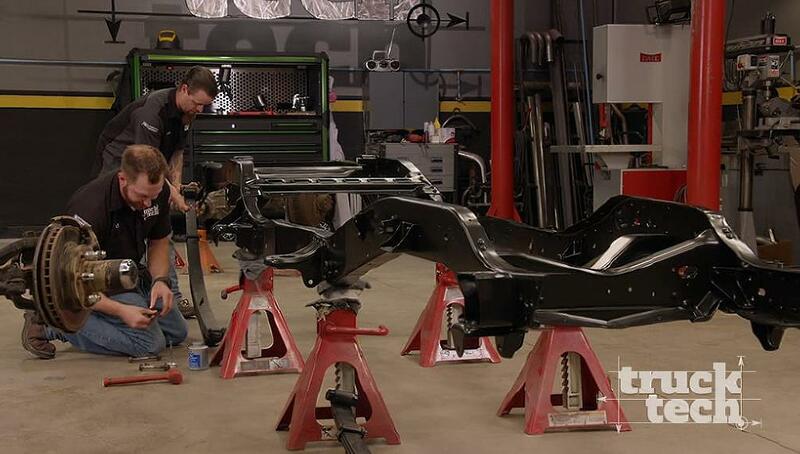 (JEREMY)>> WE THEN TORE HER DOWN TO A BARE FRAME WHERE WE FOUND A SERIOUS CRACK UNDER THE STEERING BOX. IT'S A COMMON PROBLEM ON THESE FULL SIZE CHEVYS. SO LT WELDED IN SOME SUPPORT PLATES. 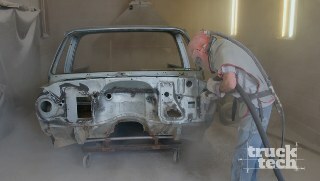 OUT BODY GOT THE SAND BLASTING TREATMENT FROM "BLAST FROM THE PAST" IN LEBANON, TENNESSEE, AND SO DID OUR FRAME, BUT WHILE WE HAD OVER THERE WE WENT AHEAD AND LET THEM POWDER COAT IT FOR US. THEY PUT IT IN A NICE SATIN BLACK FINISH AND WE COULDN'T BE MORE PLEASED WITH THE RESULTS. NOW THE GREAT THING ABOUT POWDER COAT IS WE DON'T HAVE TO WORRY ABOUT IT CHIPPING OFF ON US, SCRATCHING IT UP, RUST, STAINING, ANYTHING LIKE THAT, AND PLUS THIS ONLY COST ABOUT $750 BUCKS. SO IF YOU CONSIDER HOW LONG IT WOULD TAKE YOU TO STRIP IT BY HAND AND PAINT IT IT'S WELL WORTH THE INVESTMENT. PLUS IT'S KIND OF A MESSY JOB. (LT)>> ONE OF THE THINGS THAT WE LEARNED WHILE OUT ON THE TRAIL WITH OUR KFIVE IS WE NEED IT TO BE A LOT TALLER. WE HAVE A GOAL OF RUNNING A 35 INCH TALL TIRE. NOW THAT'LL GIVE US A GREAT BLEND BETWEEN SOMETHING WE CAN USE EVERYDAY DRIVING DOWN THE HIGHWAY AND SOMETHING WE CAN USE ON THE WEEKENDS TAKING IT TO THE TRAIL. NOW TO GET A 35 UNDER A SQUARE BODY WE NEED FOUR INCHES OF LIFT. SO ONE CALL TO BDS SUSPENSION WAS ALL IT TOOK TO GET EVERYTHING THAT WE'LL NEED. NOW IT'S ACTUALLY REALLY SIMPLE TO LIFT A LEAF SPRUNG STRAIGHT AXLE TRUCK. OUT FRONT NEW SPRINGS ARE ALL IT TAKES. THESE ARE CALLED "RIDE GLIDE" SPRINGS, AND THEY'LL GIVE THE KFIVE INCREASED ARTICULATION AND MUCH MORE WHEEL TRAVEL. OUT BACK THE BASIC KIT COMES WITH LIFT BLOCKS BUT WE CHOSE TO UPGRADE TO LIFT SPRINGS. THAT WAY WE'LL HAVE LESS AXLE WRAP AND IT'LL GIVE US A MUCH MORE STABLE RIDE. FOR SHOCKS WE CHOSE TO UPGRADE TO THESE FOX TWO POINT ZEROS. THESE WILL GIVE US A GREAT RIDE ON THE HIGHWAY AND WHEN WE'RE IN THE ROUGH STUFF OUT ON THE TRAIL. OUT FRONT WE GOT DUAL STEERING STABILIZERS, WHICH AGAIN USE THE FOX TWO POINT ZERO DAMPERS. THE KIT COMES WITH ALL THE NECESSARY LINKAGE TO CORRECT THE STEERING GEOMETRY SO YOU'LL DRIVE STRAIGHT WHILE YOU'RE GOING DOWN THE ROAD. IT COMES WITH ALL THE NECESSARY BUSHINGS, HARDWARE, NUTS AND BOLTS, EVERYTHING YOU NEED FOR A COMPLETE INSTALLATION. HECK IT EVEN COMES WITH THIS FRAME REINFORCEMENT PLATE. NOW WE ALREADY WELDED ONE IN BUT IT'S JUST COOL TO KNOW THAT YOU GET THIS STUFF. WE'RE GONNA GET STARTED BY PUSHING IN SOME BUSHINGS. A LITTLE LUBRICATION IS ALL IT TAKES AND THE BUSHINGS SLIDE RIGHT INTO PLACE. THE SLEEVE IS A TIGHT FIT, BUT A FEW TAPS OF THE HAMMER AND IT'S HOME. THE FRONT OF THE SPRINGS ARE ATTACHED TO THE SPRING HANGER ON THE FRAME, AND A LITTLE PERMATEX ANTISEIZE WILL PREVENT RUST, MAKING THE BOLTS COME OUT EASY WHEN THE TIME COMES. AS A SPRING COMPRESSES IT GETS LONGER. SO THE LEAF SPRINGS ARE ATTACHED AT THE REAR WITH A SWING SHACKLE. A FEW MORE NUTS AND BOLTS AND THE SPRINGS ARE IN. THE FORWARD MOUNT OF THE SPRING IS HELD TO THE FRAME WITH A SINGLE BOLT, BUT THE SHACKLES INSTALL A BIT DIFFERENTLY. THE OUTSIDE HALF IS ATTACHED, AND WITH BOLTS THROUGH, THE INSIDE HALF ATTACHES AND NUTS HOLD IT ALL TOGETHER, AND WITH FOUR SPRINGS CONNECTED TO THE FRAME WE'RE READY FOR SOME AXLES. (NARRATOR)>> UP NEXT, AXLE PREP. (JEREMY)>> WE DITCHED OUR FACTORY 10 BOLT AXLE FOR THIS, A FULL FLOAT 14 BOLT WE GRABBED FROM THE JUNKYARD, AND THIS IS PROBABLY ONE OF THE MOST POPULAR SWAPS FOR ANY HEAVY DUTY APPLICATION, AND A FULL FLOAT MEANS THE AXLE DOES NOT SUPPORT ANY OF THE VEHICLE WEIGHT. IT'S EQUIPPED WITH A 10.5 INCH RING GEAR AND 30 SPLINE AXLES. NOW THE REASON THIS THING IS SO POPULAR IS BECAUSE IT'S CHEAP, IT'S STRONG, AND AFTERMARKET SUPPORT FOR IT IS HUGE. NOW WE'LL MORE THAN LIKELY REGEAR IT AND ADD A LOCKER, BUT FIRST WE NEED TO RELOCATE THESE LEAF SPRING PERCHES SO THIS THING WILL FIT UNDER OUR BLAZER. THE FIRST THING WE NEED TO DO IS REMOVE A COUPLE OF BOLTS TO GET RID OF THIS BRAKE LINE. THEN I CAN START CUTTING OFF THE SPRING PERCHES WITH OUR PLASMA CUTTER. THE PERCHES ON A 14 BOLT ARE REALLY THICK AND IT TAKES SOME TIME TO CUT THROUGH THEM. SO A LITTLE PATIENCE IS INVOLVED. THEN WE CAN REMOVE THE BRACKETS THAT HOLD THE BUMP STOPS IN PLACE. AFTER GETTING THOSE CUT AWAY I'LL CLEAN UP THE METAL LEFT BEHIND. (LT)>> THIS IS THE DANA 44 FRONT AXLE THAT CAME WITH OUR CHEVY BLAZER, AND IT'S ACTUALLY THE SAME THING AS A GM 10 BOLT FRONT AXLE, AND THEY'RE ACTUALLY PRETTY STRONG. WE COULD JUST THROW IT BACK UNDERNEATH THE TRUCK AND BE GOOD TO GO BUT WE WOULD HAVE ONE MINOR PROBLEM. THIS IS A SIX BOLT AXLE AND THE REAR IS AN EIGHT. WE COULD JUST BUY THE SAME STYLE OF WHEEL IN TWO DIFFERENT BOLT PATTERNS, BUT IF WE WERE OUT ON THE TRAIL AND WE GOT A FLAT TIRE THEN WE'D HAVE TO CARRY TWO SPARE TIRES. 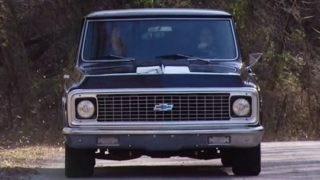 A BETTER SOLUTION WOULD BE TO FIND A DANA 60 AXLE THAT WOULD HAVE COME IN A K-30 CHEVY TRUCK OF THE SAME STYLE AS OUR BLAZER. THEY'RE SUPER STRONG AND IT WOULD HAVE THE SAME SPRING PAD WIDTH. SO IT WOULD BOLT RIGHT IN PLACE, BUT HERE'S THE PROBLEM. 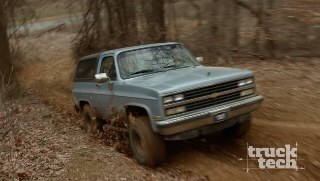 DANA 60'S FROM A LEAF SPRUNG CHEVY TRUCK ARE NEAR IMPOSSIBLE TO FIND. WE'VE BEEN SEARCHING AROUND OUR LOCAL AREA FOR A COUPLE OF MONTHS NOW AND WE'VE COME UP EMPTY HANDED. NOW THERE IS A WAY WE CAN STILL USE THIS AXLE AND HAVE EIGHT LUGS. 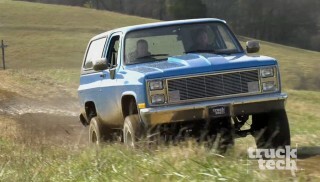 NOW CERTAIN CHEVY K-20 TRUCKS ACTUALLY CAME FROM THE FACTORY WITH AN EIGHT LUG DANA 44. SO WE'RE GONNA TAKE ADVANTAGE OF THAT, USE SOME OEM REPLACEMENT PARTS, AND CONVERT THIS AXLE INTO AN EIGHT LUG. NOW WE WILL STILL KEEP OUR EYES OPEN FOR A DANA 60, BUT IF WE CAN'T FIND ONE THEN WE'LL STILL HAVE A GOOD, INEXPENSIVE ALTERNATIVE. (NARRATOR)>> NEXT HOW TO DO A SIX TO EIGHT LUG CONVERSION. (JEREMY)>> HEY WELCOME BACK TO THE SHOP. WE'RE CONTINUING PROGRESS, GETTING OUR 14 BOLT FIT UNDER OUR KFIVE. WE'VE GOT THE ORIGINAL LEAF SPRING PERCHES CUT OFF AND THE NEW ONES ARE TACK WELDED IN, AND EVERYTHING FITS GREAT. NOW THE PERCHES ARE READY TO BE FULLY WELDED, BUT BEFORE WE DO THAT WE WANT TO TEST FIT OUR SHOCKS, AND WE WERE HOPING THE ORIGINAL SHOCK MOUNTS ON THE 14 BOLT WILL WORK FOR US BUT THEY WON'T, AND LET ME SHOW YOU WHY. AS YOU CAN SEE, THEY'RE SET OVER JUST A FEW INCHES TOO FAR, AND IF WE TRIED TO PUT THE SHOCK INTO IT WOULD JUST PUT IT IN A BIND AND THAT WOULDN'T WORK, BUT HEY, THAT'S NO BIG DEAL. ALL WE'RE GONNA DO IS USE A SET OF AFTERMARKET SHOCK MOUNTS. WE'LL BOLT IT ONTO THE SHOCK AND THEN MOVE IT UP INTO PLACE AND MAKE SURE WE'VE GOT CLEARANCE EVERYWHERE, TACK WELD IT IN. THEN WE'LL CUT THESE OLD ONES OFF. I'LL GET THE PASSENGER SIDE SHOCK MOUNT IN PLACE, AND THEN TACK WELD IT IN. WE'LL REPEAT THE PROCESS ON THE OTHER SIDE. THEN ROLL THE AXLE OUT FROM UNDER THE FRAME SO I CAN FINISH WELD EVERYTHING. (LT)>> WE'VE GOT THE FRONT AXLE BACK UNDERNEATH THE BLAZER, AND IT BOLTS UP TO THE BDS LIFT SPRINGS WITHOUT ANY CUSTOMIZATION BECAUSE IT'S THE ORIGINAL FRONT AXLE. SO WE'LL GET STARTED ON OUR EIGHT LUG CONVERSION BY TAKING OFF THE CALIPERS. NEXT UP, UNSCREW THE OUTER PART OF THE FREE WHEELING HUB. THERE ARE A COUPLE OF SNAP RINGS THAT HAVE TO GO, AND THE LOCK OUT CAN BE PULLED AWAY. 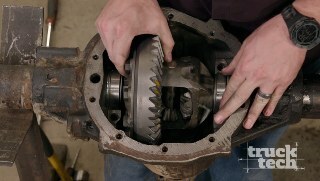 WITH BOTH SPINDLE NUTS REMOVED, THE OLD ROTOR COMES OFF. FINALLY THE BACKING PLATE HAS TO GO. WITH THE DISASSEMBLY COMPLETE WE NEED TO TALK ABOUT HOW WE'RE GONNA PUT THIS BACK TOGETHER WITH EIGHT LUGS. NOW FIRST OF ALL IF YOU HAVE A SIX LUG DANA 44 FROM THE EARLY '70'S YOU'RE GONNA HAVE TO SWAP OUT THE SPINDLE. SEE THE EARLIER VERSIONS USE A SMALLER WHEEL BEARING. LATER VERSIONS, LIKE OURS, ALREADY GOT UPDATED TO THE BIG BEARING SPINDLE. SO WE WON'T HAVE TO MAKE ANY CHANGES THERE. NEXT UP IS THE CALIPER MOUNT AND BACKING PLATE. YOU CANNOT REUSE THE ORIGINAL SIX LUG VERSION. NOW THESE ARE A LITTLE BIT HARDER TO FIND BUT WE FOUND A SET ON EBAY AND THEY'RE BEING SHIPPED TO US NOW. SO WE'RE GONNA LEAVE THOSE OFF TEMPORARILY. NEXT UP IS JUST A COUPLE OF GENERIC PART STORE REPLACEMENT ITEMS, LIKE A THREE QUARTER TON EIGHT LUG HUB AND ROTOR ASSEMBLY, AS WELL AS A FEW WHEEL BEARINGS. NOW THE COOL PART ABOUT THIS SWAP IS YOU CAN ACTUALLY REUSE ALL YOUR ORIGINAL LOCKING HUBS. SO THAT'LL SAVE YOU A LITTLE BIT OF MONEY FOR PARTS. WE'RE ASSEMBLING EVERYTHING TEMPORARILY WITHOUT ANY SEALS OR GREASE SINCE WE'LL BE PULLING THIS WHOLE THING BACK APART IN THE NEAR FUTURE TO INSTALL THE BRAKE BACKING PLATES. NOW THIS EIGHT LUG CONVERSION IS SOMETHING YOU CAN DO IN AN AFTERNOON, AND IT'LL SAVE YOU A TON OF MONEY OVER HAVING TO BUY A DANA 60. YOU AS EXCITED AS I AM? (JEREMY)>> I DON'T KNOW IF I'M AS EXCITED AS YOU ARE. (LT)>> THIS IS THE BEST PART OF THE PROJECT, WHEN WE GET TO MAKE A ROLLING CHASSIS. ALL RIGHT, PRETTY CLOSE. LET'S PUT IT UP IN THE AIR AND GET THOSE STANDS OUT. (JEREMY)>> FROM WHAT I CAN SEE IT LOOKS OKAY. 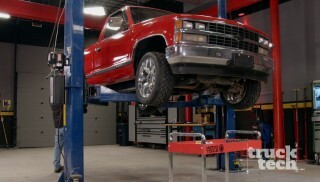 (LT)>> AS FAR AS LIFT KITS ARE CONCERNED, THIS INSTALLATION IS ABOUT AS SIMPLE AS THEY COME. BETWEEN THE FOUR NEW LEAF SPRINGS AND THE FOX TWO POINT ZERO SHOCKS THIS BLAZER WILL HAVE A GREAT RIDE ON AND OFF THE TRAIL. NOW WHEN IT COMES TO STEERING THERE ARE TWO DIFFERENT OPTIONS. BDS SUPPLIES GEOMETRY CORRECTED BRACKETS THAT'LL WORK WITH THE LIFT, OR YOU CAN CHOOSE TO SWAP OUT TO A CROSSOVER STYLE STEERING. (JEREMY)>> YEAH WE'VE GOT BOTH AXLES UNDER THE FRAME, AND WE'RE HAPPY WITH WHERE THIS 14 BOLT SITS, BUT THEY'RE NOT GONNA STAY UNDER THERE LIKE THIS. WE'LL PROBABLY YANK THE 14 BOLT OUT AND REGEAR OUT, BUT NOT ONLY THAT, WE'LL WIRE WHEEL EVERYTHING DOWN, CLEAN IT UP, AND GET A FRESH COAT PAINT ON THEM SO THEY MATCH THIS GOOD LOOKING FRAME. (LT)>> WITH THE ROLLING CHASSIS OF OUR KFIVE OFFICIALLY MOCKED UP WE'RE AT THE POINT OF THIS PROJECT THAT WE NEED TO DECIDE HOW WE'RE GONNA MOTIVATE THIS BLAZER DOWN THE HIGHWAYS AND UP THE MOUNTAINS. WE NEED TO PICK AN ENGINE, AND A TRANSMISSION, AND HAVE A WAY TO SPLIT THAT POWER BETWEEN THE REAR AXLE AND THE FRONT. (JEREMY)>> WELL I KNOW ONE THING, WE'RE NOT RUNNING THOSE SMALL TIRES. WE'VE GOT SOMETHING A LITTLE BIGGER IN MIND, BUT WHAT IS THE BEST WAY TO MOVE A HEAVY TRUCK WITH BIG TIRES DOWN THE ROAD? (LT)>> WELL I SUPPOSE WE NEED A WHOLE LOT OF POWER. (JEREMY)>> AND A WHOLE LOT OF TORQUE. 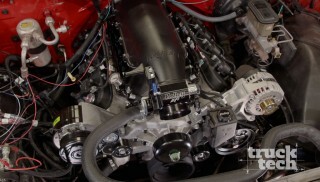 (LT)>> WHAT ENGINE COMES TO MIND WHEN YOU NEED SOMETHING THAT PRODUCES A BOATLOAD OF TORQUE? FOR US IT'S THE BIG BLOCK CHEVY. (JEREMY)>> WE PICKED UP THIS 454 HO CRATE ENGINE AWHILE BACK AND IT'S BEEN SITTING IN THE CORNER WAITING ON THE PERFECT PROJECT, AND THIS IS IT. (LT)>> THIS ENGINE COMES OUT OF THE CRATE WITH 438 HORSEPOWER AND A WHOPPING 500 POUND FEET OF TORQUE AT ONLY 3,500 RPM, AND THAT COULD DEFINITELY GET US INTO A LITTLE BIT OF TROUBLE, BUT NOT ENOUGH. THIS IS A GOOD FOUNDATION TO BUILD FROM. 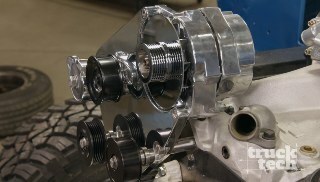 IT COMES WITH A FOUR BOLT MAIN BLOCK, FORGED STEEL CONNECTING RODS AND CRANK SHAFT, AND FORGED ALUMINUM PISTONS. NOW WE'RE GONNA MAKE SOME CHANGES. WE'RE GONNA YANK THE HEADS OFF, PUT SOME ALUMINUM HEADS ON THERE THAT FLOW A LOT MORE AIR, CHANGE THE INDUCTION AROUND, CHANGE THE CAM SHAFT. WE HAVE A GOAL OF ABOUT 600 HORSEPOWER. (JEREMY)>> FOR A TRANS TO GO BEHIND THAT BIG 454 WE CHOSE A FOURL-80 FROM MONSTER TRANSMISSION, AND WE WENT A LITTLE BIT DIFFERENT. 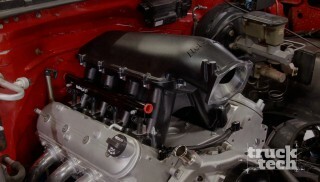 WE CHOSE A FULL MANUAL VALVE BODY. SO THERE'S NO COMPUTER NEEDED TO SHIFT THIS THING, AND WE CHOSE THEIR SUPER SPORT VERSION BECAUSE IT'S RATED UP TO 750 HORSEPOWER, AND TO CONNECT THE ENGINE AND TRANSMISSION TOGETHER WE GRABBED A 3,000 RPM STALL SPEED CONVERTER WITHOUT A LOCK UP CLUTCH, AND THE NEXT TIME YOU SEE THIS THING WE'LL MATE THE TWO TOGETHER AND DO A FEW ENGINE MODS. (LT)>> YOU'VE SEEN US USE TIG WELDERS MANY TIMES, BUT WE HAVEN'T TALKED MUCH ABOUT THE BASICS OF TIG. THEY'RE PROBABLY THE MOST VERSATILE WELDING TOOL YOU CAN HAVE IN A FAB SHOP BECAUSE YOU CAN WELD NEARLY ANY METAL IN ANY THICKNESS WITH THE COMBINATION OF ELECTRICITY, TUNGSTEN, AND FILLER METAL. YOU CAN WELD MILD OR STAINLESS STEEL, ALUMINUM, TITANIUM, CHROMOLY, OR EVEN INCONEL. PRETTY MUCH ANY OF THE EXOTIC ALLOYS THAT YOU'D USE IN MOTORSPORTS FABRICATION. NOW WITH A STICK OR A MIG WELDER YOU CAN KIND OF RUN OVER THE TOP OF ANYTHING, WHETHER IT BE RUST, OR PAINT, OR OIL. I MEAN SHOULD YOU? NO, BUT WITH THE TIG WELDER SURFACE PREPARATION IS KEY TO ENSURING QUALITY CONSISTENT WELDS. SO I'M GONNA SHOW YOU SOME OF THE TIPS AND TRICKS I USE TO MAKE SURE YOU HAVE GOOD, CLEAN WELDS EVERY TIME. FIRST CLEAN UP THE AREA WHICH YOU ARE GOING TO WELD WITH ACETONE. THIS WILL REMOVE ANY OILS OR GREASE FROM THE SURFACE. IF YOU GRIND IT FIRST YOU COULD BE PUSHING OILS AND CONTAMINANTS FURTHER INTO THE MATERIAL. ON A RUSTY PIECE OF METAL LIKE IT'S IMPORTANT TO REMOVE ALL OF THE CORROSION. OUR PREFERRED METHOD IS FLAP WHEEL ON AN ANGLE GRINDER. ONCE ALL THE RUST IS GONE AND THE EDGES ARE PREPARED, AND YOU HAVE NICE, SHINY METAL, CLEAN IT AGAIN WITH ACETONE INSIDE AND OUT. THEN START WELDING. NOTICE HOW THE ARC IS BRIGHT AND STABLE WITH A NICE BLUISH COLOR, AND NO POPPING OR SLAG. LET ME SHOW YOU WHAT HAPPENS IF I TRY TO WELD DIRTY METAL. IT HAS OIL FROM CUTTING, A LAYER OF MILL SCALE, AND RUST. THE ARC IS UNSTABLE AND POPS, AND THE TUNGSTEN IS GETTING DIRTY. ONE OF THE MORE DIFFICULT PARTS OF TIG WELDING IS KEEPING YOUR TUNGSTEN ELECTRODE CLEAN. YOU CAN BE WELDING ALONG AND HIT A LITTLE POCKET OF RUST, OIL, OR ANY OTHER CONTAMINATION AND THE MOLTEN PUDDLE CAN ACTUALLY BUBBLE UP AND STICK TO THE TUNGSTEN ELECTRODE, AND WHEN THAT HAPPENS IT'S BEST JUST TO STOP WELDING AND SHARPEN YOUR TUNGSTEN, CAUSE IF YOU DON'T THE ARC QUALITY WILL SUFFER AND YOUR WELDS WILL JUST GO DOWNHILL. SO I'M GONNA SHOW YOU AN INEXPENSIVE TO SHARPEN YOUR TUNGSTEN WITH TOOLS YOU PROBABLY ALREADY HAVE IN YOUR SHOP SO YOU DON'T HAVE TO GO OUT AND BUY A DEDICATED TUNGSTEN GRINDER. TAKE A DRILL AND SET IT TO LOW SPEED. SLIDE THE TUNGSTEN INTO THE END, AND TURN ON THE GRINDER. YOU WANT TO SLOWLY SPIN THE TUNGSTEN AND WORK IT BACK AND FORTH ON THE GRINDING WHEEL AS TO NOT MAKE GROOVES. GRIND THE TUNGSTEN UNTIL ALL THE IMPURITIES ARE GONE, AND SHARPEN IT TO A POINT. YOU WANT TO HAVE A WHEEL THAT YOU USE ONLY FOR TUNGSTEN. OTHERWISE YOU COULD BE CONTAMINATING THE ELECTRODE WITH OTHER METALS, WHICH WOULD MAKE THE ARC UNSTABLE. ALSO DON'T HOLD THE TUNGSTEN PERPENDICULAR TO THE WHEEL. YOU WANT TO GRIND IN THE SAME DIRECTION AS THE ELECTRODE. THIS WILL HELP KEEP THE ARC TIGHT AND STRAIGHT. 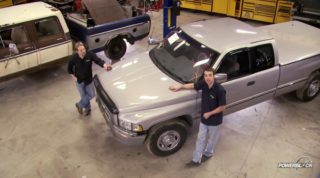 (JEREMY)>> YOU GUYS KNOW ONE OF THE HARDEST PARTS OF RESTORING YOUR TRUCK OR SUV IS FINDING OEM PARTS THAT ACTUALLY FIT LIKE THEY SHOULD. WELL LMC TRUCK HAS MADE IT EASY. SQUARE BODY CHEVYS, INCLUDING OUR '89 KFIVE, ARE SO POPULAR LMC CARRIES ALMOST EVERY PART, JUST LIKE THIS COMPLETE DOOR FOR OUR KFIVE THAT COMES READY TO PAINT, BUT YOU CAN ALSO GET ALL THE GUTS, LIKE GLASS, WINDOW CHANNELS, I MEAN YOU NAME IT. SO FOR A FREE CATALOG VISIT LMC TRUCK DOT COM. (LT)>> IF YOU'VE EVER INSTALLED AN AFTERMARKET SET OF WHEELS AND TIRES ON YOUR LATE MODEL TRUCK THEN YOU KNOW THAT DEALING WITH A TPMS SENSOR CAN BE QUITE A HASSLE. THIS IS THE MD MAX TIRE PRESSURE DIAGNOSTIC TOOL FROM MATCO TOOLS. 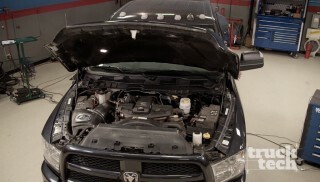 IT WORKS NEAR VEHICLE'S ONBOARD TPMS SYSTEM TO READ SENSOR ID'S, BATTERY LIFE, PRESSURE, TEMPERATURE, AND YOU CAN EVEN PROGRAM THOSE NEW SENSORS. IT'S COMPATIBLE WITH ALL LIGHT DUTY VEHICLES, BOTH IMPORT AND DOMESTIC. FOR MORE INFORMATION ON MD MAX VISIT MATCO TOOLS DOT COM. (JEREMY)>> LIQUID WRENCH IS SPORTING A NEW LOOK WITH THEIR PRO PENETRANT AND LUBRICANT. THIS FAST ACTING ANTISEIZE FORMULA PENETRATES CORROSION, LOOSENS RUSTED BOLTS AND PARTS, STOPS SQUEAKS, AND DISPLACES MOISTURE. IT'S GREAT FOR LOW LIGHT AREAS WITH THEIR BUILT IN FLASH LIGHT LED SO YOU SEE WHERE YOU SPRAY. IT FEATURES TWO SPRAYING OPTIONS, ONE WITHOUT THE STRAW, AND ONE WITH, AND HAS AN ON/OFF LOCKING COLLAR FOR CONVENIENT NO MESS STORAGE. CHECK OUT THEIR FAMILY OF PRODUCTS AT LIQUID WRENCH DOT COM. 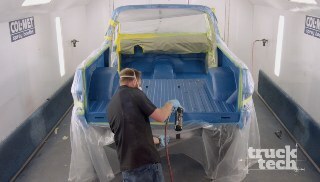 THANKS FOR WATCHING TRUCK TECH, WE'LL SEE YOU NEXT TIME.